Why are my Shipping and Order totals Estimates? Shipping is billed at Actual Freight. The Estimated Shipping charge is the average cost to ship similar value orders. This amount can change based on size and weight of packaging. You are not being charged the Estimated total that is displayed at time of checkout. This amount is only used as an initial authorization. When your order ships you will get a email with the actual total that was charged to your Credit Card. If the Actual Freight is higher then the amount Estimated, we will contact you to let you know and to see how you would like to proceed. 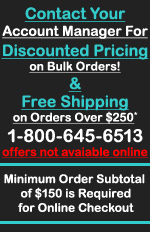 Most orders will ship at a lower then estimated freight charge. You only have to pay sales tax if you are located in New Jersey, New York, or Texas.